Last summer we finally installed our mini-split heat pump. This is our second heat pump, following on the heat pump water heater we installed a year ago. See the post about heat pumps to find out why. The mini-split heats (and occasionally cools) the house. 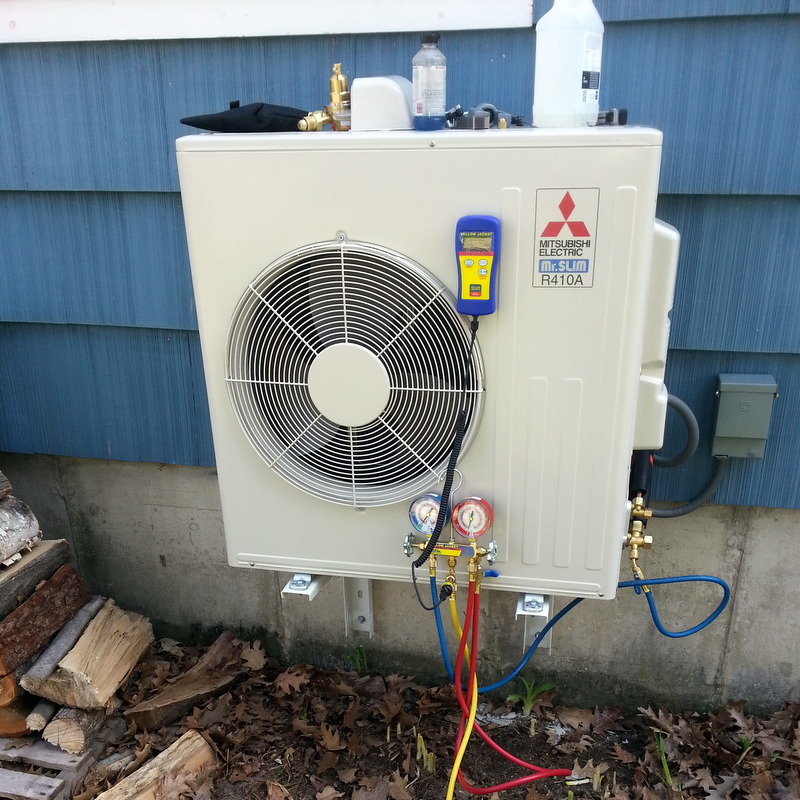 This 3′ X 3′ compressor is mounted on the outside of the house. And this 4′ wide blower is mounted in our dining room. 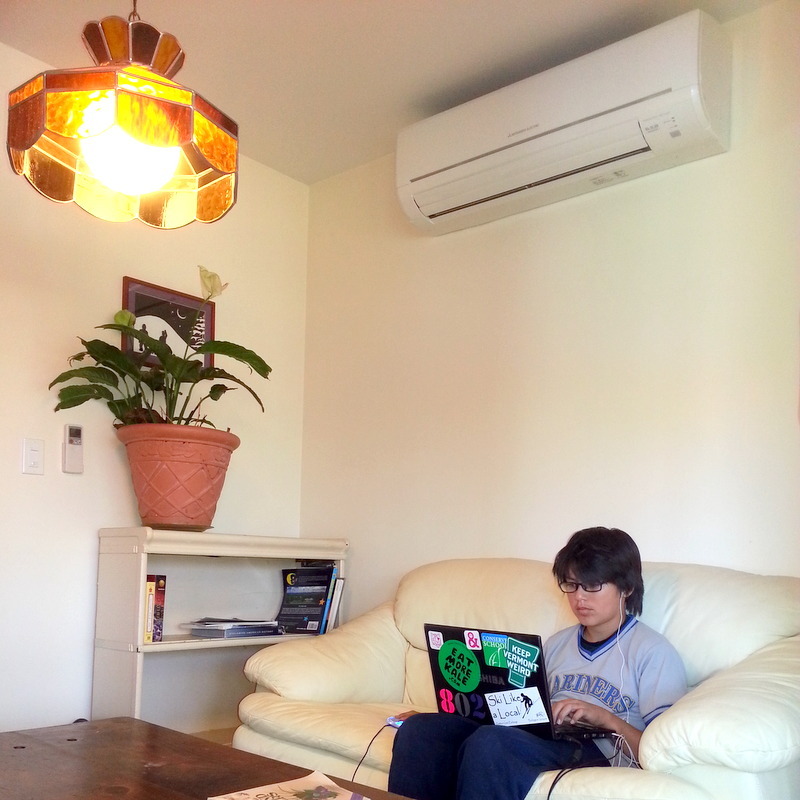 The heat pump delivers heat to a central place in the house. We chose a mini-split because it uses electricity to make heat, and electricity is plentiful and free at our house thanks to our photovoltaic solar system. The heat pump enables us to use electricity at greater than 200% efficiency: possible because the heat energy comes from outdoor air. Electricity is used just to get the energy from outside to inside, and to “concentrate” the energy for a higher temperature. Our mini-split is a Mitsubishi Hyperheat, one of a new generation of mini-split heat pumps that are designed for cold climates. The Hyperheat can deliver heat when it’s as low as -13 degrees F outside. With a renewable energy system like PV and a heat pump heating system a home could become “net zero energy”: generating as much energy as is used over the course of a year. As appealing as that may sound, there are lots of things to consider before selecting a mini-split heating system. Currently cold climate heat pumps only come in this “ductless” model, which means heating and cooling can only be delivered to one spot in the house. If the house layout isn’t open enough a single mini split will not keep the house comfortable. Our house is blessedly small, but as was the fashion in the 50’s, not at all open. The room with the mini-split gets very warm, the bedrooms are often too cool. The mini-splits don’t make a lot of heat, and as the outdoor temperature drops the output of the mini-split drops too. Most homes will need more heat than a mini-split delivers, particularly in very cold weather. We have a woodstove to supplement the mini-split. Even though the mini-splits are highly “efficient” they still use a lot of electricity. With expensive electricity rates or with demand charges on your electric account a mini-split could be very expensive to operate. If you make your own electricity, as we do, heating with your heat pump is free, but it’ll eat up a lot of your home grown energy. We won’t know until a year has gone by whether we harvest enough solar energy to run the whole house including the mini split. In the meantime it just feels neat to float along with no energy bills month in, month out.